What do you do when you love a pie’s filling but aren’t big into pie crust? 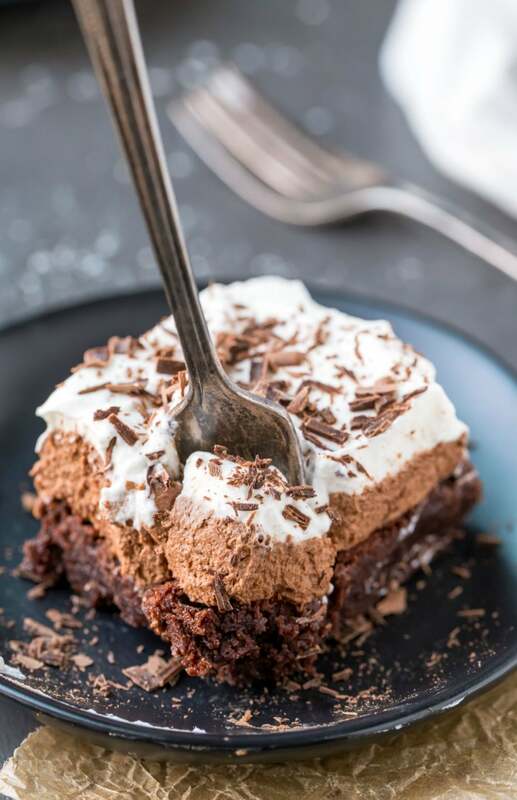 You trade the crust for brownies and end up with an incredibly delicious mash-up like these French Silk Brownies. These French silk brownies aren’t difficult to make, but they do require quite a bit of time between the cooling and chilling times. The time is time well spent, though, because these are some of the best brownies I’ve ever had. I get a little nervous about feeding my family anything with raw eggs, so the chocolate layer doesn’t have any raw eggs (or any eggs at all) in it. 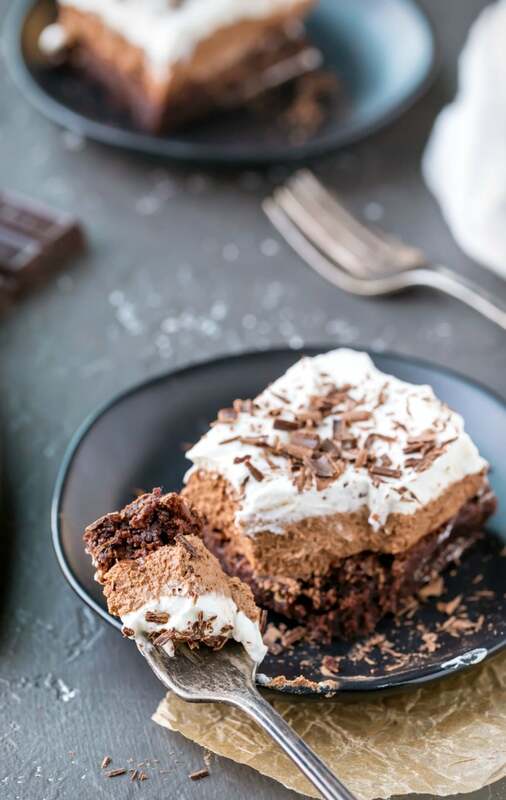 The chocolate filling is so light and fluffy and delicious that I don’t think you’ll miss them. 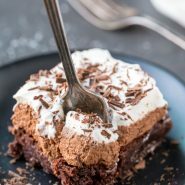 If you’ve tried this French silk brownie recipe, don’t forget to rate the recipe and leave me a comment below. I love to hear from people who’ve made my recipes! You can SUBSCRIBE to receive my latest recipe newsletters or FOLLOW ME on FACEBOOK, INSTAGRAM and PINTEREST for even more delicious food. 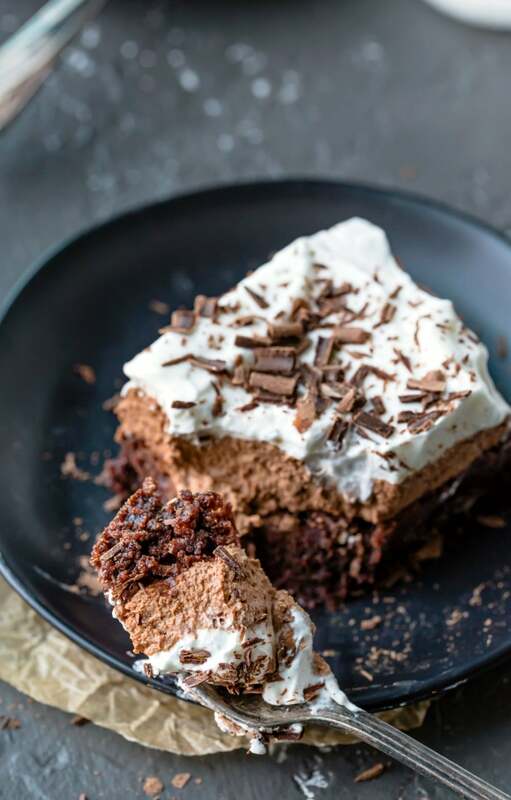 French silk brownies are chewy brownies topped with a rich and creamy chocolate silk layer and then all topped with whipped cream. Preheat oven to 350 F. Grease or use parchment paper to line a 9x9-inch baking pan. Turn heat to low, and stir in sugar. Let cook, stirring constantly, for 2-3 minutes. Let mixture cool for about 5 minutes. Add flour, cocoa powder, and salt. Whisk in until just incorporated. Pour batter into prepared pan, spreading batter as needed. Bake for 20-30 minutes. The edges should look done, but the center should still look shiny. A toothpick inserted in the center should come out with a few fudgy crumbs. To make the mousse, heat marshmallows, chocolate, and milk in a medium saucepan over low heat, stirring constantly until completely melted and smooth. Cool completely. It's important that this mixture is completely cool. Otherwise you will end up with liquid mousse. In a separate bowl, beat whipping cream to stiff peaks. Spread mousse evenly over brownies. Cover, and chill brownies for at least 30 minutes. To make the whipped cream, beat cream and sugar together until stiff peaks form. Brownies can be served at this point, or you can chill them for cleaner cut lines. Cover, and chill leftover brownies. *I've used Dutch-processed and regular unsweetened cocoa powder. Either one will work. 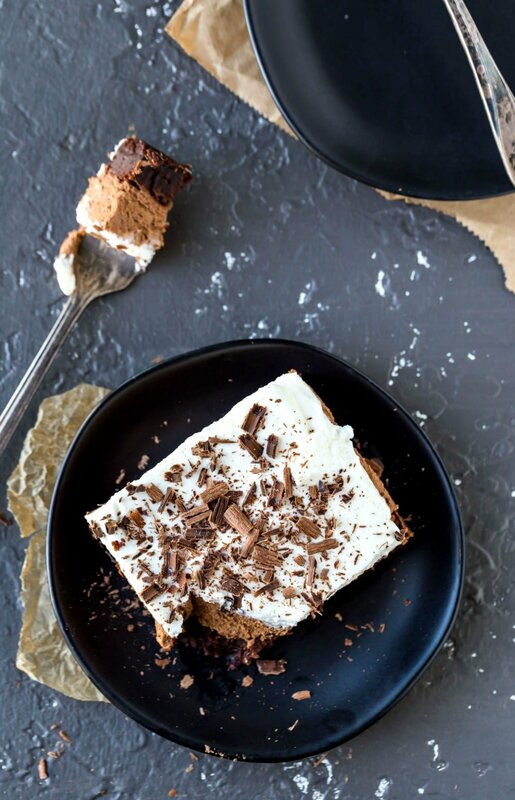 ** In order to avoid pulling up the mousse, I pile the whipped cream in the middle, and then gently spread out to the corners. ***Prep time doesn't include cooling or chilling times. Yay!! I’m so glad! Thanks for taking the time to come back and comment! OMG YUM! My mouth is literally watering! Looks absolutely delicious!